For Christmas, my sister Christy totally spoiled me.. again. Some of you may remember that she bought me an early Christmas present of six amazing Deborah Lippmann shades (I have worn 4 of the six and can't wait to try the other two). However on Christmas Day she got me even more Lippmann! An awesome set with two colors, base and top coat, polish remover called their "Get Nailed" set, as well as the polish featured here! 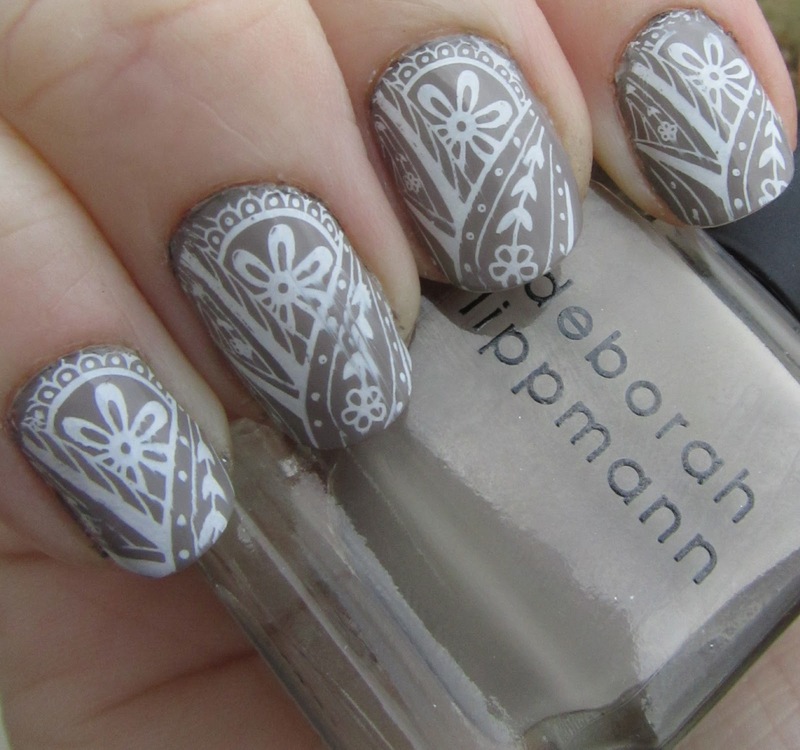 I went all out Lippmann with these nails - I started with their ridge filling base coat, which I really liked a lot! I then added two coats of Waking Up In Vegas, which is a "greige" (as I have seen it called, gray/beige), or a kind of taupe creme. When I first saw this one I wasn't sure if I would like it on me - these neutrals really have to look right with your skin tone! But I loved it. Absolutely loved pretty much everthing about the polish, actually. I really think this is a fabulous color, very trendy and wearable for professional situations. The application was fairly flawless and was almost a one coater, totally smooth and this held up really with with basically no chipping! I then added a design with Konad plate m60 for the design in Konad Special White. I topped it all off with a coat of Deborah Lippmann Addicted To Speed, which is a really nice top coat - just as speedy and glossy as Seche Vite but I felt like there was less tip shrinkage. Maybe I have a new favorite top coat? I wanted to include a picture of the polish alone, to show how perfect and smooth it was! Unfortunately, I was still figuring out how to use my new digital camera I got for Christmas, so the color balance was a little off because I had it on the wrong setting. Oops. The color is much more accurate in the first shot. I finally think I have gotten the hang of the new camera now and hope it will make some of the pictures on my blog even better! Man, I wish I could line up the stamps that well...great job! Thanks! It took a lot of practice to get fairly decent at Konad, and I still mess up.. often. :) Glad you guys like this one! very pretty!! i like it!! That konad looks super awesome! Maybe I'm just a newb, but what's "tip shrinkage"? Because I think I'm experiencing it with my Seche Vite, too! Hi there, new follower here! I love your blog, and especially this manicure. I hope you don't mind if I answer Lash Lady's question.. Tip shrinkage is when your top coat "shrinks" and pulls back the layers of polish, leaving a visible line of white on the tips of your nails.